You know that feeling when you arrive in any big city for the first time, and everything looks so big, so busy, unfamiliar and slightly daunting, that you instantly feel even more minute and insignificant? Well that's exactly how I felt as the boat from Vung Tau arrived in to the heart of the hustle and bustle of Ho Chi Minh City. Usually, the nice thing about riding into a city is that from the suburbs, you get to attune yourself with the new rules and speeds of the road, but when you are dropped into the heart of the city, it’s like jumping straight onto a full speed running machine. Fortunately, in this case, without the face-plant. The boat ride in was a very straight forward 1.5 hours and 250,000 VND or £8.30, and was nice to witness life from the water. It’s often easy to forget that with such big water systems in a city like Ho Chi Minh or Bangkok, that there are so many people dependent on, and spending their life by the water, instead of the hustle and bustle of inner city living. Except for booking my accommodation, which I did on the morning of my arrival, I’d done very little research about what to do, see and eat, with the rationale that Yen, my Vietnamese friend who I’d met in Hoi An, was going to show me the bright lights of Ho Chi Minh. As I’ve mentioned before, I tend not to do the ‘touristy’ things, and instead choose to walk the streets, meet people and immerse myself in the real life and soul of the city. For me, it’s these things that stay with you and have an affect on your being, not the experiences of seeing something that is soon forgotten when you see one better and is compared. Each to their own of course. That night, Yen and I arranged to meet at The Racha Room, a very cool, upmarket, not so ‘local’ restaurant in the heart of Ho Chi Minh, with a very cool vibe and an equally cool menu and cocktail list. The Racha Room, Racha, meaning ‘Royal’, in Thai, delivers Thai accented, Pan Asian cuisine and is a perfect place for sharing small plates, described as “street and hawker specialties from Asia, prepared under one roof”. Now, I’m not really a cocktail fan, but the Conubine; a vodka, lychee, elderflower and apple cocktail was very tasty, and a probably a very good reason why we produce insulin, because boy was it sweet. Two of those later an I was doing cartwheels along the bar, with my pants on my head and my sock on my………foot. Well, that's what my heart thought. The food was great, and Yen and I shared two different dishes, including; salmon sashimi, with citrus, coconut and orange dressing, herb salad, crispy nori, shredded cabbage and crispy fish skin, which was excellent. We also had a take on duck pancakes, but with sliced pork belly, soft tortilla wrap, served with a spicy, plum and tomato jam, Asian coleslaw and cucumber and spring onion. The Racha Rooms both pleased and impressed me. Salmon sashimi, with citrus, coconut and orange dressing, herb salad, crispy nori, shredded cabbage and crispy fish skin. Sliced pork belly, soft tortilla wrap, served with a spicy, plum and tomato jam, Asian coleslaw and cucumber and spring onion. Yen and I were able to just talk to each other so naturally, it was great. The conversation never stopped, nor were we ever in need to create conversation, it just flowed. We talked about all things from politics, to culture, to boyfriends and ex-girl friends. Yen is a 43 year old, Buddhist, Vietnamese girl who’s father was a senior officer within the communist party and Yen was very open about her life and the Vietnamese people, which I found incredibly interesting and made a lot of sense to me, having just ridden the length of the Vietnam and met, seen and experienced a lot of people along the way. Fancying a change of scenery, Yen then took me to Ria, a cool Tapas restaurant a few doors down from The Racha Rooms, where we tucked into some nice red wine, ate some tapas and listen to some live Latin American music, which was great fun. We then did a very Vietnamese thing and went for 01.00AM Phở, at one of Yens favourite local street restaurants, where we took our pew on child sizeD plastic furniture. We continued our great conversations and talked about some quite intimate details and were very open with each other, which was great. The following day, Yen took me for lunch at the very popular Cuc Gach Quang, a cleverly renovated old villa; owned, redesigned and decorated by an architect, who captures the essence of Vietnamese traditional life and communism within, which evokes a “Vietnamese Family Moment and Meal”, in doing so. 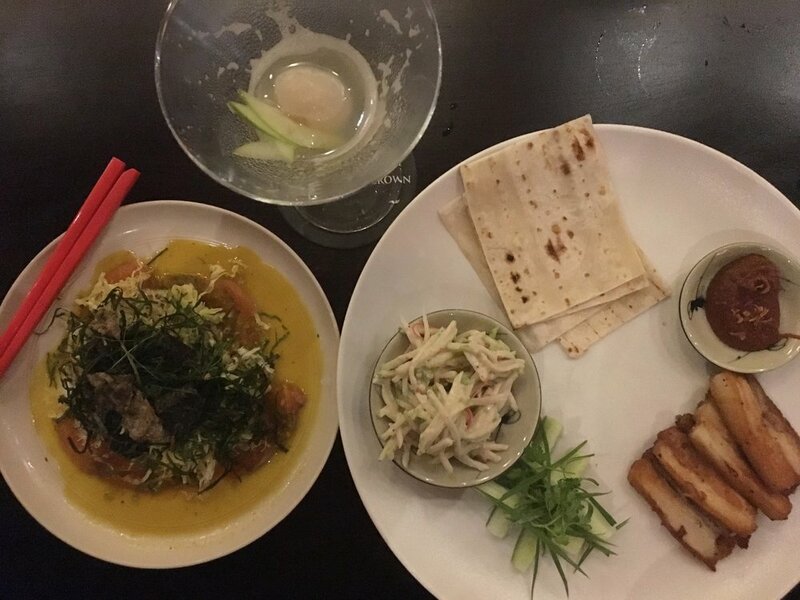 Located in the quieter, northernmost reaches of District 1, this, not-so secret hideaway should be on everyone’s restaurant list if visiting Ho Chi Minh City, and if you do it with an attractive, Vietnamese speaking local, even better. It’s one of those restaurants where being ordered for, makes the experience. One of the food treasures of Ho Chi Minh, the food is based around vegetables and healthier eating, but meat lovers rejoice, there is still plenty to indulge even the most carnivorous amongst you. Yen took the reigns and I just nodded and smiled as she reeled off what was coming. Pan fried tofu with crispy lemon grass and garlic, baked egg plant with Laab salad, braised pork belly with soy boiled eggs, clam soup with green melon (a marrow/ cucumber type vegetable) and steamed rice. Probably my favourite meal in Ho Chi Minh City and Southern Vietnam. I never thought I’d say it, but tofu rocks man, so delicious. Everything on the table was absolutely delicious, and my newfound love for fresh tofu, re-affirmed. Yen had work plans that afternoon and evening, but had left me with a few suggestions for dinner. One of those being a popular Japanese inspired pizza restaurant, which just didn’t compute in my head. “Japanese and pizza”, “Japanese pizza?” Pizza wouldn’t have normally been on my foodie list in a city like Ho Chi Minh, but this just sparked too much intrigue for me not to try. I walked the streets for the afternoon, and enjoyed a casual few cold beers, watching life in Vietnams biggest city. It was the start of a 4 day pubic holiday, unbeknown to me, until Yen had mentioned it at lunch, and this would often mean more people and less amenities. There had been a few things on my ‘necessities list’ that I‘d ‘needed’ for a while, but due to the holiday, the shops and physiotherapist were closed. There seems to be a theme here, as when I arrived into Hanoi with Mike and Christian, it was Tet holiday celebration, which literally meant ‘errything’ closed for about 10 days. It wouldn't surprise me if that included hospitals as well. With this in mind, and with how popular Yen had said 4 p’s Pizza was, I wasn’t surprised to see a small queue of people out the front. Ahhh, the perks of dining solo. “Mot” I said, holding 1 finger up incase my attempt at saying “1”, went amiss. That always surprises me! You say something like “1” or “Mot”, for example, and you’ll get a completely blank, docile look in response, then hold up your finger, meaning “1”, and they say exactly what you’ve just said, in response. I appreciate it’s an intonation and tonal language, but really, how far wrong could I be each time? Very, seems to be the correct answer. ….. “ yes, if you’d like to follow me” sir, the lady at the front desk gesturing towards the stairs. 4p’s could be a restaurant set in an old, disused concrete multistory parking lot. Grey, blank, and cold concrete industrial walls with brick thrown in for contrast, will little to no art on the walls which offers little in the way of ambience or style; in contrast, the stark minimalist, veering more towards the brutalist. Fortunately for me and the other 15 people sat around the wood burning oven and pizza chefs in front, the ambience came in the form of pizza making. I do find, however, that a group of chefs in white aprons, lined up in front you, wearing face masks, offers a somewhat, sterile experience, more akin to one of Hestons development kitchens, a SARS quarantined laboratory. As for the food, well, sadly, the menu offered as much as the blank concrete walls; just trying to be that little bit too out there and cool, and whoooosh, miss the target completely. Sure, the pizza tasted like pizza and it was fresh and well made, but Papa Johns and Dominoes have been serving chicken teriyaki, or tandoori chicken pizza for inebriated and stoned 20 some-things for a good few years now, and they are about as fusion as a +/+ magnet. As for the pasta, please don’t chiffonade some nori seaweed paper, sprinkle it on a Pasta Carbonara and call it Japanese/ Italian fusion. Call it a mistake, and we can move on. Now that I’ve taken the boxing gloves off, the good bits. Firstly, they offer beer samplers , and for me, this is great, as I love the concept behind beer samplers. A selection of 3 different beers of your choosing, presented on a wooden board, with felt tip, hand scribbled names. The beers were good and glasses were lovely, but again, if you’re going to go to the effort of providing something unique, don’t run head first into the last hurdle and scribble the names on post-it-notes. As I said, my pizza was a tasty pizza, fresh dough, well baked, and in the words of Forrest Gump “That’s all I have to say about that”. With all of that said, who I am to criticize? There’s hundreds of rave reviews online offering positive feedback. Ho Chi Minh City is a buzz of an evening, with the bright lights showcasing an incredible side to the city. I found myself walking around and just taking everything in. The following day I took Surly Temple out to explore Ho Chi Minh City and as I‘m cycling along on a naked Surly Temple, the traffic ahead started cueing up at the traffic lights. Needing to turn right and the path in front being obstructed, I thought I’d innocently, yet slightly cockily, just nip up this shiny looking, 45° degree curb and bypass the traffic. Well, that shiny looking 45° degree curb might have possibly been the slipperiest curb in the world, and like Bambi on ice, as soon as my front wheel hit it, wham! My front wheel went sliding and I was off and down. I managed to take the impact of the fall straight onto my front, in a press up position and popped straight back up again, as to not make a scene. “ha, serves you right numb-nuts” I thought. I took a ride around for the afternoon, then stopped in the central boulevard area of Ho Chi Minh, and just sat and read my book for an hour, whilst imaging how life has changed here over the years. Taking a seat in the heart of Ho Chi Minh City after a day riding around. It was my last night in Ho Chi Minh and Yen suggested dinner at Nha Hang Ngon, an upmarket street food style restaurant, who’s sister restaurant I’d already eaten at in Hanoi and had a great meal. I’d already read up on Nha Hang Ngon online, and it sounded perfect for my last night in Ho Chi Minh. I arrived early and took a seat inside this incredibly ornate and characterful building, with a central, water feature focal point creating a lovely, zen like atmosphere. I was taken to a table, and took a seat, but as quickly as I was sat, I was standing again. I hadn’t looked around enough, I was in awe of this amazing building and interior. It wouldn’t have looked out of place in a James Bond movie set in Asian. Rich mustard yellow walls, will nooks and crannies everywhere, ornate detail in the woven wood works, each room, open to the next with a central, balcony and stairway over looking a water feature focal point. The lighting was great, and although you could see lots of different tables around you, felt secluded and private. I took a walk around the restaurant and happened across a large food station and just loved the look of the bowls and food and pile up ready to be served a la minute, or ,to order. Would Yen arrived, she said she’d rather sit outside, which I thought was a shame, as it lacked any of the atmosphere that indoors offered, but I wasn't fussed. Yen then explained, that about 90% of the food served in the restaurant was bought in from other restaurants around Ho Chi Minh, essentially aggregating and selling from one roof, which I thought was interesting. The food was delicious. We ordered to share, with crispy pork belly with rice noodles, rice paper rolls, pork gyoza and Vietnamese pizza or Banh Trang Nuong, a rice paper base with an assortment of toppings, rolled into a cigar and eaten, which was interesting. Yen also ordered Bun Mam, which she explained was a noodle soup, made with fermented fish paste and thought to be worse smelling and tasting the Durian by the Vietnamese. On trying it, I thought it was delicious, much to Yens surprise. I couldn’t taste anything offensive in it what so ever, where as Durian is a very, very acquired taste. Yen and I enjoyed our last dinner together and said our good byes and me, my thanks for her hospitality in showing me around Ho Chi Minh City. It really was a pleasure to meet you Yen, thank you. It was Labor day and Ho Chi Minh was absolutely buzzing with excitement. I’m not sure I’ve ever seen so much traffic in all my life, and although beeping is something you are apparently born with in Vietnam, the beeping seemed to have stopped now that everyone was moving together in the same direction. The police were out in full directing traffic, and the city lights were setting the mood. Ho Chi Minh really is a great, 21st century city, with its green parks, giant tree’s, old charm, modern infrastructure and delicious food offerings. 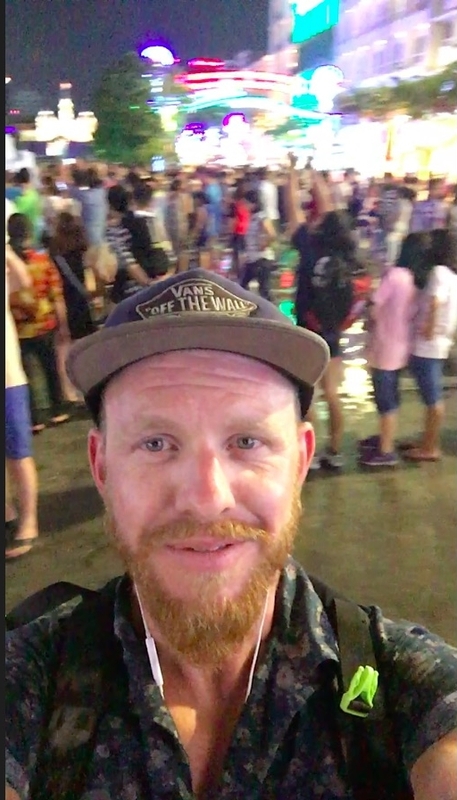 Having cycled the full length of Vietnam over 3 months, I’ve seen some truly incredible sights and met some outstanding human beings, but with Vietnams many faces, not all of them are pretty. I do wonder what is in-store for Vietnam in the future, but I very much doubt I’ll be returning to witness it first hand. Thank you for reading and I hope you enjoyed it.